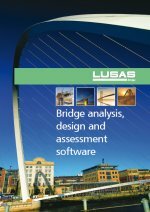 Unrivalled state-of-the-art linear and quadratic element libraries; advanced material models; linear, nonlinear and seismic isolator joint models; direct and eigen solvers, and a fast solver option collectively allow all types of bridge engineering problem to be modelled and solved as efficiently as possible. Additional element information is given on the product specification page. Concrete creep including AASHTO LRD 7th Edition, CEB-FIP Model Code 1990, EN1992-1-1:2004 Eurocode 2, IRC:112-2011 and creep only for Chinese creep model code. Joint material models are used in conjunction with joint elements to fully define the properties for linear, nonlinear and seismic isolator joints. Linear joint models include those for spring stiffness only and for general joint properties having spring stiffness, mass, coefficient of linear expansion and damping factor. User-defined force/displacement and axial force dependent curves are supported. Nonlinear joint models include elasto-plastic uniform tension and compression with isotropic hardening, elasto-plastic general with isotropic hardening, smooth contact, frictional contact, nonlinear user-defined, matrix properties, and others. Seismic isolator joint models include viscous dampers (Kelvin and Four Parameter Solid), lead rubber bearings with plastic yield and biaxial hysteretic behaviour, friction pendulum system with pressure and velocity dependent friction coefficient and biaxial hysteretic behaviour, and others. Direct solvers are provided in all software products. Eigen solvers are provided in selected LUSAS Bridge products. A Fast Solvers option provides a set of additional solvers for use with particular LUSAS Bridge products.